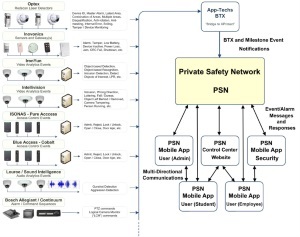 Private Safety Network (PSN) software provides a comprehensive communications platform to send and receive real-time information, and to distribute mass notifications during an emergency or safety event. PSN provides the tools to skillfully lead and communicate during an emergency situation. When paired with App-Techs' BTX Bridge to XProtect software, PSN's Status Reporting System and Advanced Location Technology enhanced features receive and interpret input from third-party security devices to increase situational awareness and trigger automated security responses. Quickly communicate with individuals, groups, and other PSN networks. 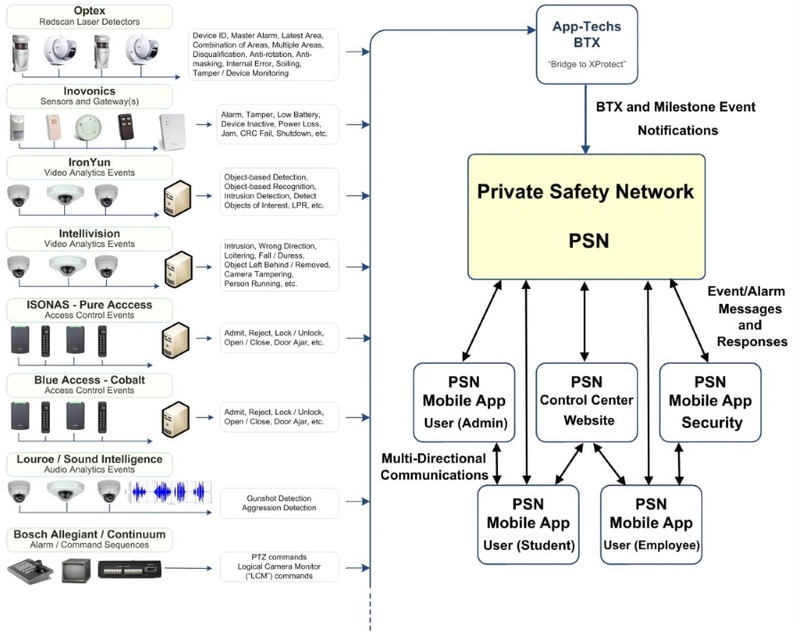 For a detailed description of all available features, visit Private Safety Network (PSN). Add App-Techs' own BTX Bridge to XProtect software to PSN and trigger automated alarms and event messages to selected PSN user groups. Sensors include: Cameras, Milestone XProtect VMS, access control systems, Code/QR scanning technology, and audio devices. Report the status of every room on campus or facility, request medical help, and barcode/QR code scan user IDs or rosters to report user locations in each room.